"Love is what makes us. It’s also what breaks us. If this is true, Rowen just became the proverbial wrecking ball to Jesse’s life. Love is what makes us. It’s also what breaks us. Love’s made Jesse and Rowen. Love’s about to break them too." Rowen and Jesse are one of my all-time favorite couples, so you’re probably wondering why I didn’t pick this book up immediately. I put this book off for over a year because I was terrified of it. I mean that blurb made me so nervous and I knew I was in for a bumpy ride with this one. I am so glad I finally made myself read this one though because I truly adore Jesse and Rowen. Jesse Walker is such a great guy and he hurt my heart in this one. Poor Jesse does not deal with the pregnancy news well because he worries for Rowen and the baby. Jesse has always been a worrier, but he went a bit crazy here. He loves Rowen so much and my heart hurt for him as he navigated this new terrain. He was constantly worried he would lose Rowen and the baby at any minute. I also loved seeing how much Rowen has grown as a character. She has come so far from Lost & Found but is still the same in so many ways. She is still the tough girl we first met, but she has also learned to open up now. She and Jesse together are my favorite and their banter is fantastic. The characters who stole the show though were Garth and Josie. Every time they busted up into a scene they took control of it. I love this Garth and he had me cracking up nonstop. One scene in particular with him yelling and a hospital was probably my favorite. And Josie is always her wonderful self, so she was just great. 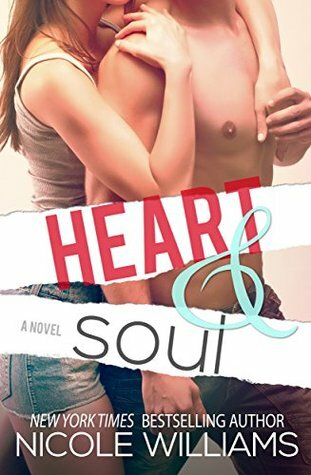 Heart & Soul delivered the emotional punch I expected and I’m so glad I finally made time for this book. Rowen and Jesse still remain one of my all-time favorite couples and I loved this extra story we got for them. I know exactly what you mean, in terms of being terrified of reading a book you have been dying to read! It's hard when you've enjoyed the previous book(s) in the series and don't want the new one to disappoint. It sounds like the character development was really well written. I'm glad you ended up enjoying this book, Teresa! Great review! I've put off reading this one for the same reason!! I love the characters and the story, but I was so worried about it. But I know I'll love it. Need to make time to read this one as soon as I can!! You'll love it Magen it is so good! And it is a quick read too. I shouldnt have put it off. I still need to catch up with this series.